The perfect steam sauna experience is exactly what we had in mind with SteamSpa steam generators. Easy to install and even easier to operate these steam generators produce a consistent flow of soft and soothing steam thanks to the cleverly designed dual tank technology while minimizing any distracting operational noises. Compact in size and design these generators have plenty of accessory options to make sure there is a perfect setup to meet your needs. As easy to install and operate as our generators already are, the featured Auto Drain system makes maintenance easier by purging the generator of any excess water/minerals that would later contribute to issues down the line. All in all you get a safe, quite, reliable, luxurious steam sauna experience with our compact powerhouse of a steam generator. Power: 4.5kW, 240V, 19A. Built in auto drain purges the generator after each steam bath substantially reducing the chance of mineral, and rust build-up, prolonging the generator's operating life. Easy installation. Get the perfect steam sauna experience at home with the SteamSpa Oasis 7.5kW Steam Bath Generator Package. The package includes a 7.5kW QuickStart generator, control panel, steam head, pressure relief valve and auto drain. The steam head uses aromatherapy to give you an even more relaxing experience; just add a few drops of your favourite scent and enjoy. Give yourself and your family the perfect steam sauna experience at home with the SteamSpa Oasis 9kW Steam Bath Generator Package. The package includes a 9kW QuickStart generator, control panel, steam head, pressure relief valve and auto drain. The steam head uses aromatherapy to give you an even more relaxing experience; just add a few drops of your favourite scent and begin to enjoy. 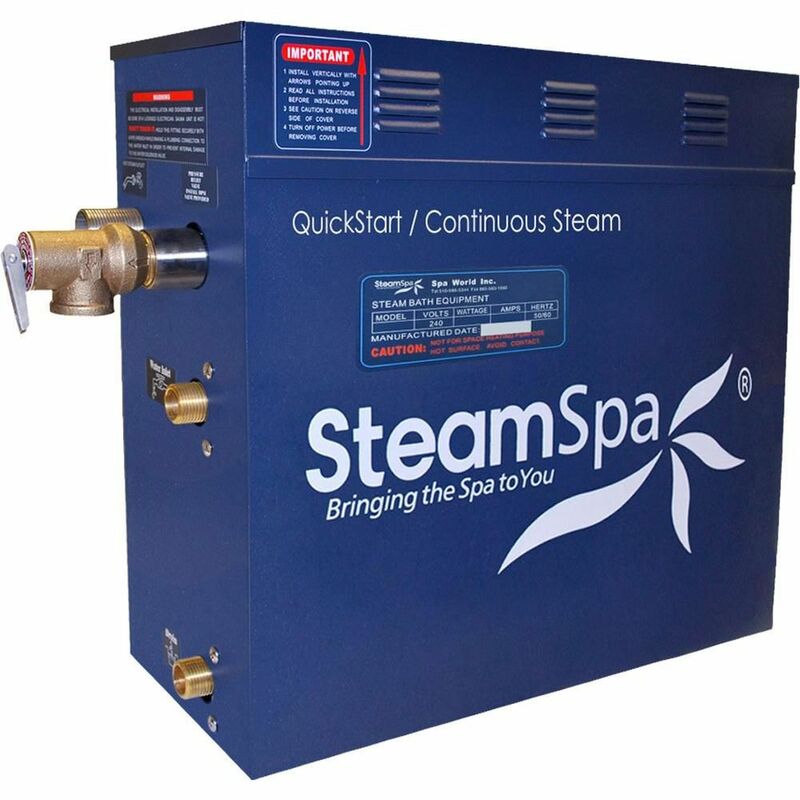 4.5 KW QuickStart Steam Bath Generator The perfect steam sauna experience is exactly what we had in mind with SteamSpa steam generators. Easy to install and even easier to operate these steam generators produce a consistent flow of soft and soothing steam thanks to the cleverly designed dual tank technology while minimizing any distracting operational noises. Compact in size and design these generators have plenty of accessory options to make sure there is a perfect setup to meet your needs. As easy to install and operate as our generators already are, the featured Auto Drain system makes maintenance easier by purging the generator of any excess water/minerals that would later contribute to issues down the line. All in all you get a safe, quite, reliable, luxurious steam sauna experience with our compact powerhouse of a steam generator. 4.5 KW QuickStart Steam Bath Generator is rated 5.0 out of 5 by 1. Rated 5 out of 5 by Kevin from Building custom Hot Tubs . I used this to run my Concrete block hot tum i built on my patio its c... Building custom Hot Tubs . I used this to run my Concrete block hot tum i built on my patio its cheaper than buying a manufactred one.